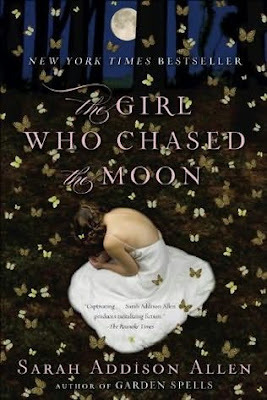 The Girl Who Chased the Moon was written by Sarah Addison Allen. Emily Benedict came to Mullaby, North Carolina, hoping to solve at least some of the riddles surrounding her mother's life. But the moment Emily enters the house where her mother grew up and meets the grandfather she never knew, she realizes that mysteries are solved in Mullaby, they're a way of life: Here are rooms where the wallpaper changes to suit your mood. Unexplained lights skipped across the yard at midnight. And a neighbor, Julia Winterson, bakes hope in the form of cakes, offering them to satisfy the town's sweet tooth - but also in the hope of rekindling a love she fears might be lost forever. Can a hummingbird cake really bring back a lost love? Is there really a ghost dancing in Emily's backyard? The answers are never what you expect. But in this town of lovable misfits, the unexpected fits right in. Once again the author's site for the book is amazing. I love the little book excerpts that come alive in her "tour of downtown Mullaby". And the cake recipes???? I'm ready to run out and buy the ingredients for Hummingbird Cake!